Home » Starting BJJ » I haven’t been able to make anyone tap. Is this normal? I haven’t been able to make anyone tap. Is this normal? Yes, it is normal to not make anyone tap for a long time. Don’t be discouraged if you can’t submit people even after months of training. When you do eventually tap someone, it will likely be another white belt or an even newer student. 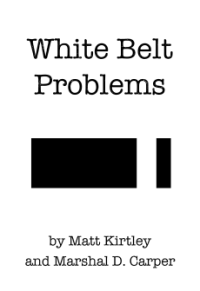 It’s fairly common for white belts to not even tap out a blue belt for 12 months or more (roughly around how long it takes to get a blue belt). Submissions are the most exciting moves in BJJ, so people want to jump right into being good at them, but that’s not how it works. That would be like expecting to throw nothing but KO punches as a novice boxer, or shooting nothing but 3-pointers the first time you pick up a basketball. You need more skill and experience first, and that simply takes time. As a beginner, your focus should be on defense and escapes, learning the basic positions, and simple skills like base, balance, and posture. Blue belts aren’t even expected to be submission machines. You will be learning submission all along, of course, but they don’t become a primary focus until the later belts.